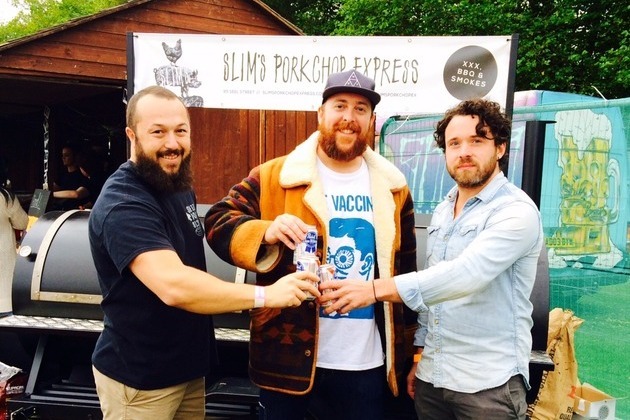 Owners of funky Liverpool restaurant brands Salt Dog Slims and Slims Pork Chop Express are celebrating this week after their busiest Liverpool Food & Drink Festival experience on record. Matt Farrell, co-owner of the group that also operates Santa Chupitos, El Bandito and 81 Ltd said:"This is our 5th year as a group at the Festival. We began with Santa Chupitos in 2009 and now focus each year on the quality of our food offering from Salt Dog Slims and Slims Pork Chop Express. It's been a great opportunity for us to share with people the passion we have for food and where we source our ingredients from, especially given the record number of people visiting our stands. It was also really apparent how many independent Liverpool businesses participated and the positive impact that will have in creating further confidence in the burgeoning restaurant scene here. The weekend was almost overwhelming given the number of loyal customers who visited us as well as visitors from outside of the city."